A Fool for Fruit Fools! Fruit Fools are a great dessert to have in your repertoire. They can be quickly prepared, use the fruits in season, can be very last minute or made ahead of time and are therefore, pretty easy. All you really need is to have some fresh and heavy cream…you always have heavy cream in the fridge, don’t you? Fruit Fools—I have no idea where the name comes from, but I’m surmising it may be because in Britain, fools are made with a pudding base most of the time, and let’s face it, this sort of resembles a pudding, so you are “fooled” into thinking that it is a pudding??? The Goddess took a stab at it. If you know the reason for such a name, please share. But for summer, The Goddess prefers the whipped cream version, so that’s what we’ll be talking about. Anyway, this is a perfect summer dessert. It’s fast, refreshing and it uses seasonal fruits at their finest moment of flavor. There are a couple of different ways to prepare a fool. (Oh God, there are so many things I could say here, but The Goddess is taking the high road!) Generally speaking, fools are last minute desserts, but they don’t have to be—see Option #3. COOKING TIP: Before we go any further there’s a tip I want to pass on to you. When I make whipped cream to serve with anything, instead of adding some powdered (confectioner’s) sugar (I still add the vanilla extract, because I don’t think you can ever overdo vanilla), I usually add about 2 tablespoons of instant vanilla pudding per cup, to the cream, as I whip it. It helps stabilize or “set” the cream a bit, so it won’t collapse so much. 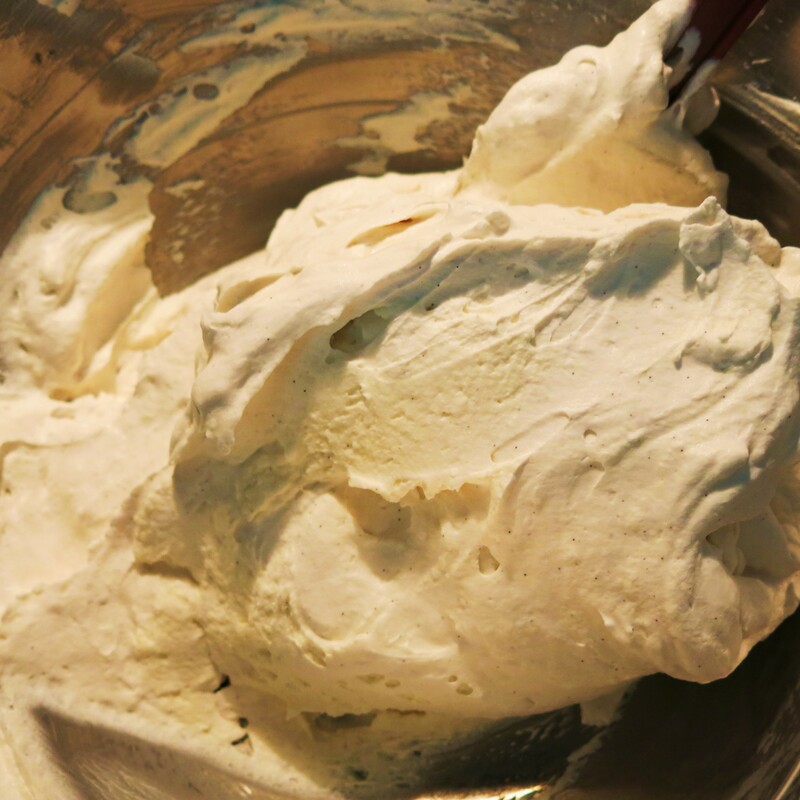 You can whip cream before your guests arrive and it will hold in the fridge, waiting for you. I would do this with both Option #1 and #2, but because of the mascarpone in Option #3, it’s sort of redundant. 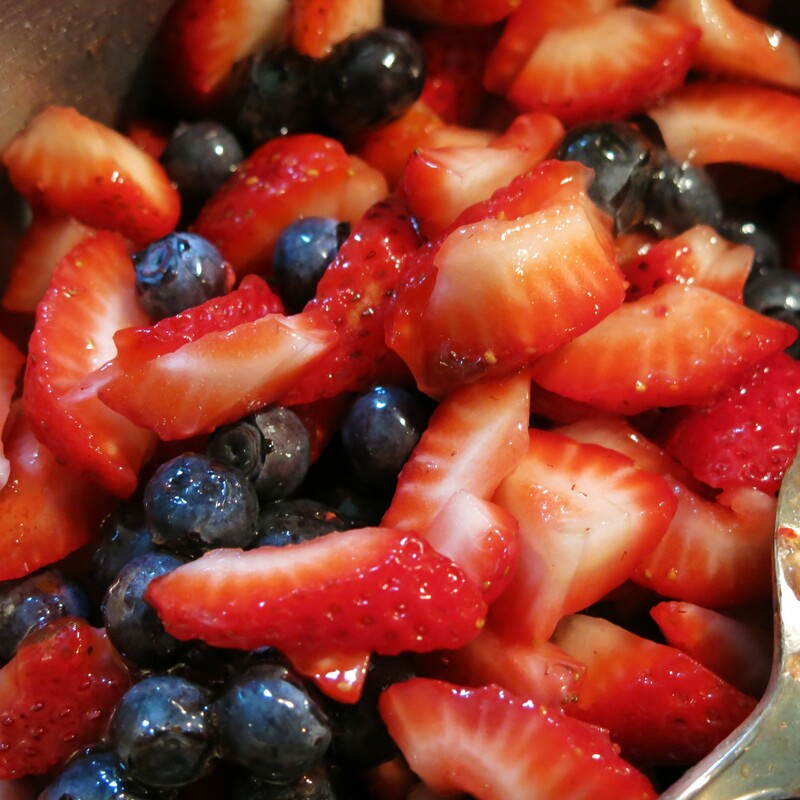 Option #1: Simply crush berries, peaches, nectarines, etc., with a bit of sugar and a drizzle of balsamic vinegar or lemon juice. Set aside while you whip some cream with a bit of powdered sugar and some vanilla extract. Whip to stiff peaks. Then, just fold the fruit into the whipped cream, leaving streaks of fruit and pour the whole thing into a pretty bowl or individual containers (martini glasses are nice!) and serve. It’s nice served with fingers of pound cake or even on top of pound cake slices instead of ice cream. 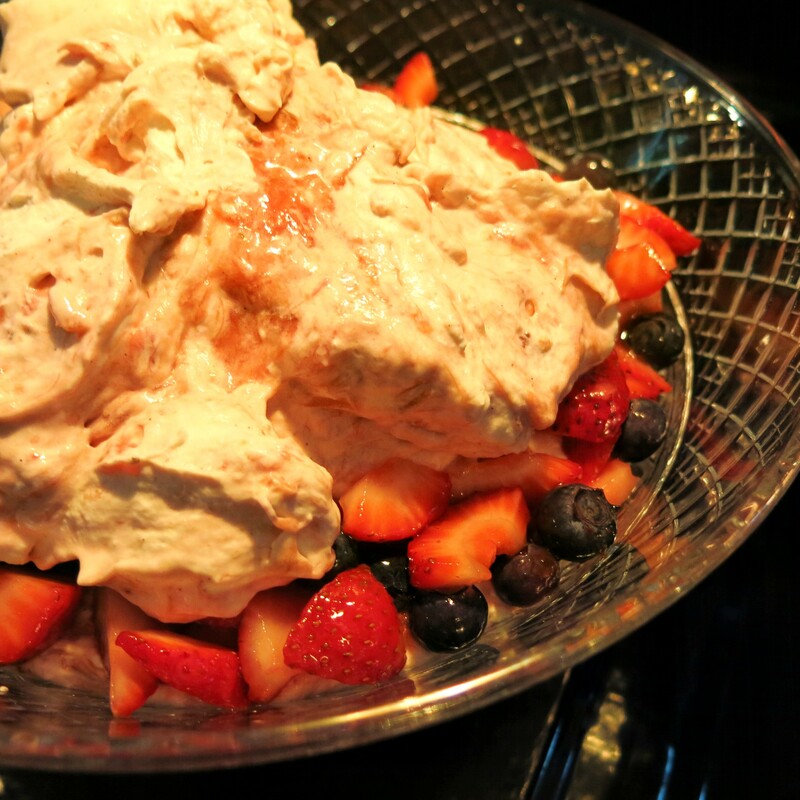 I have served strawberry fool on top of sliced, seasonal strawberries! But this really should be prepared no more than 20-30 minutes before you plan to eat it, but it probably best served immediately. Option #2: You’re going to cook about half of the fruit (diced, if peaches or strawberries are used). You’ll want about 2-4 cups fruit and about 1-2 tablespoons sugar/cup fresh (or frozen) fruit, depending on the sweetness of the fruit. 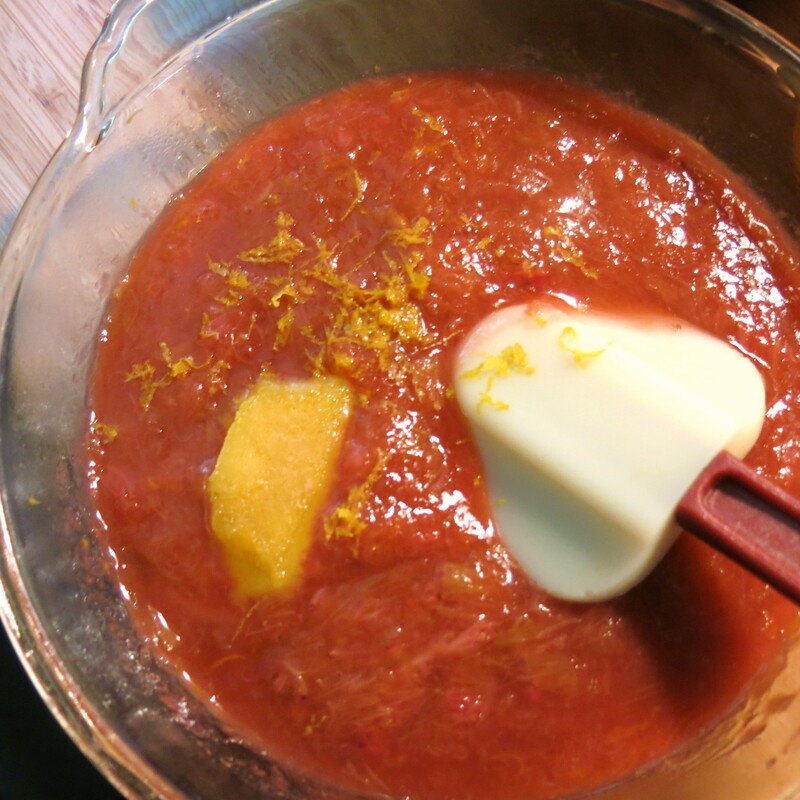 You’ll cook the fruit until it softens and the juice is thickened and the pan is almost dry. Watch it carefully. The cooking must be done ahead, as the fruit needs to chill before using. Therefore, you can prepare the fruit several days ahead and chill until ready to use. As you did in the first option, you’ll just fold the chilled fruit into the whipped cream at the last minute, leaving streaks of fruit and pour the whole thing into a pretty bowl or individual containers (martini glasses are nice!) and serve. This can be done about an hour before you’re going to serve it, but keep it chilled. Option #3: This version was born because I needed a dessert that I could carry and would hold for at least 1 hour. This option allows you to make the fool several hours ahead, but no more than 4 hours before you’re going to serve it, or the berries begin to weep and you may end up with a fruit soup, not a bad dessert option, but that’s not what our goal is today. We both cook part of the fruit, in this case some rhubarb and strawberries, for the fruit swirl and a bit of added strawberry-flavored gelatin, orange zest and frozen orange juice concentrate (FOJC) , then chill thoroughly. We use raw fruit, too. Our complimentary fruits are strawberries and blueberries with a bit of sugar and (FOJC) or use 1-2 tablespoon Cointreau or other orange liqueur. This fool has mascarpone cheese and Greek-style yogurt in it. You beat them together just until combined and smooth. 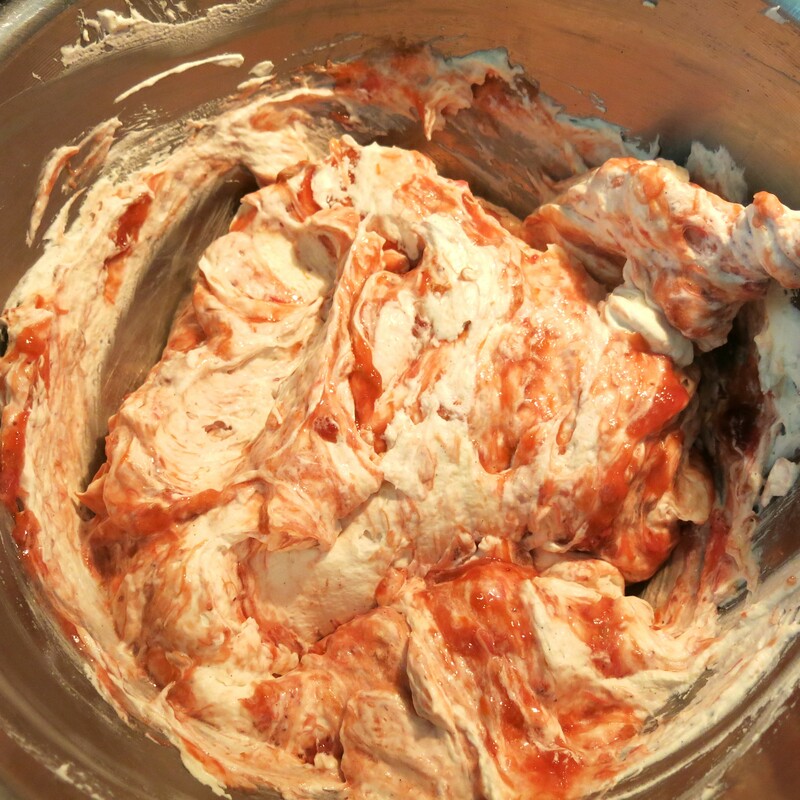 Fold the whipped cream into the mascarpone mixture. 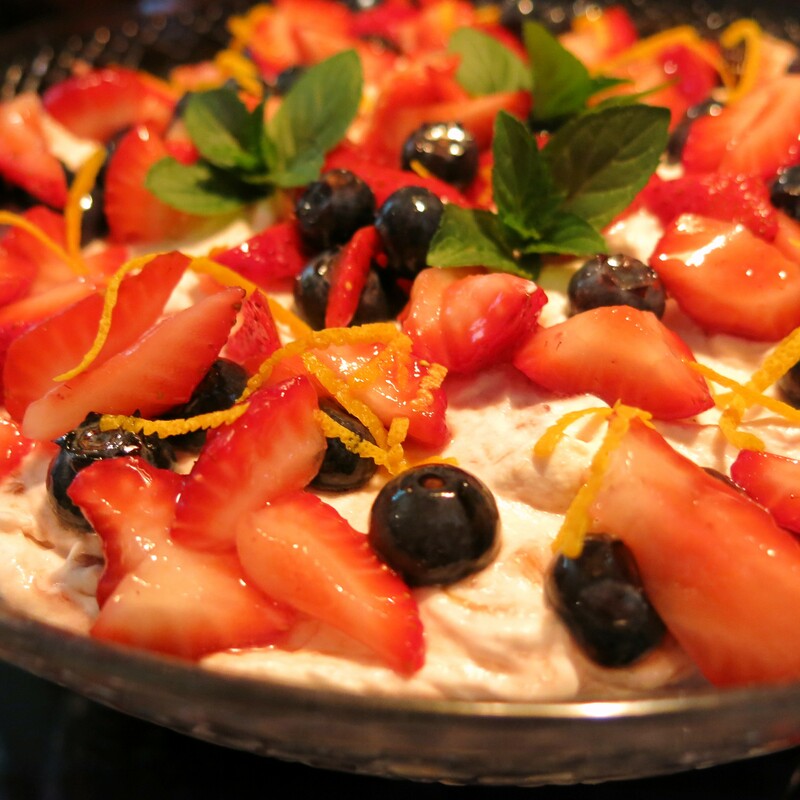 Because the mascarpone cheese helps stabilized the whipped cream (not to mention it’s a little taste of heaven), then fold in the chilled, cooked fruit mixture and layer this all together with the fresh fruit, garnish, cover and carry this to an event (or use it for your own dinner party! 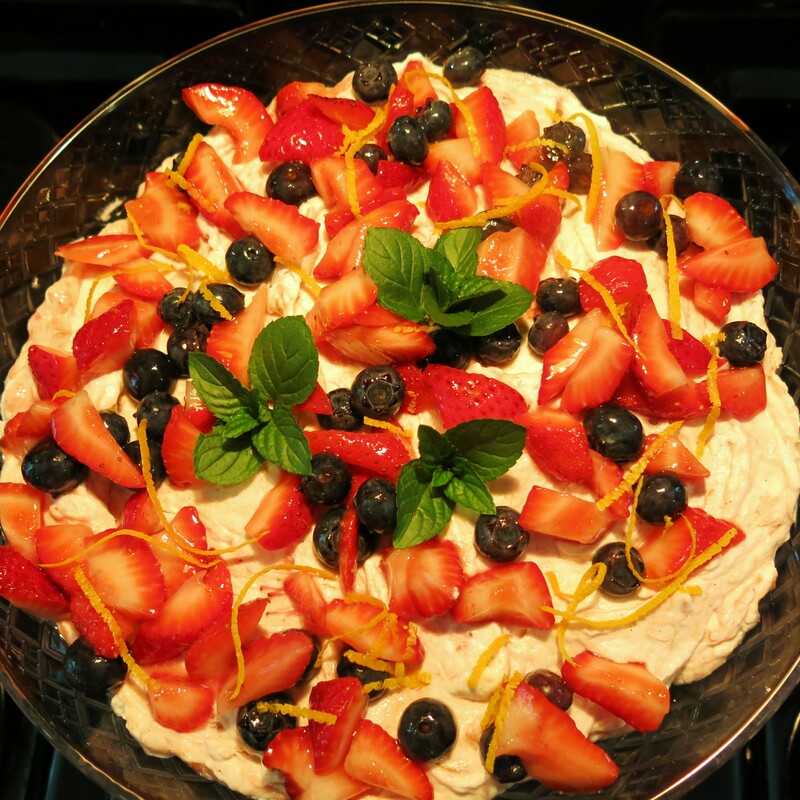 ), pop the bowl in the fridge and dessert will be ready to serve when you are. Fruit Fool to Carry You Far and Away! *the rhubarb must be cooked; this can be done up to 3 days ahead. For the Fruit Swirl: Follow the direction for cooking the fruit of choice; watch it very carefully so it doesn’t burn. You may need to add some extra liquid a teaspoon at a time. 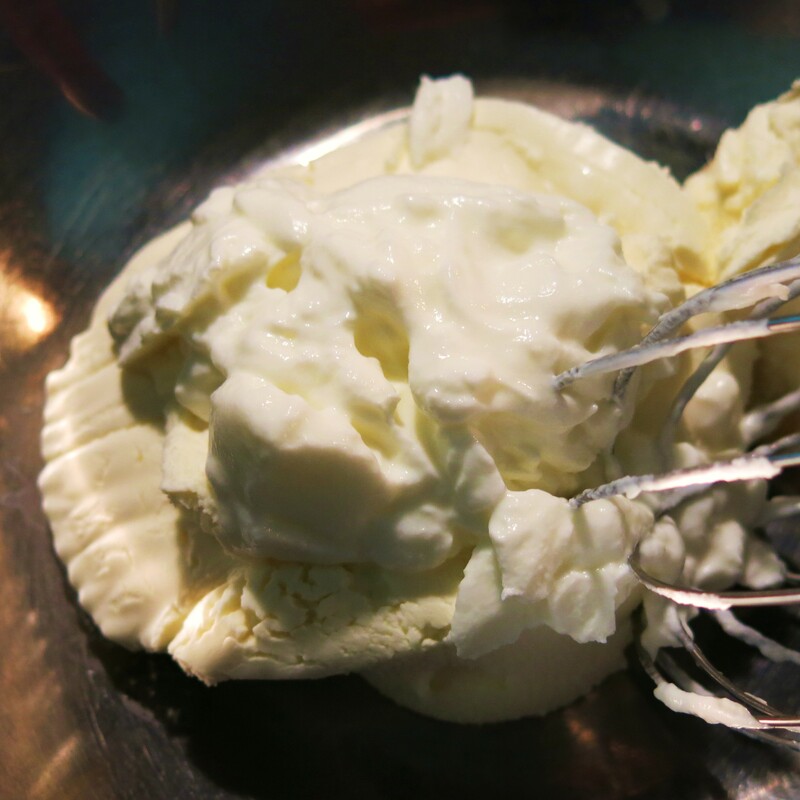 For the Fool: In a large, chilled bowl, beat the cream until almost soft peaks form. Add the vanilla and sprinkle in the confectioner’s sugar, continue to beat until the mixture has firm peaks. In a separate bowl, whisk the mascarpone with the yogurt to loosen it. Whisk in a small amount of the whipped cream (about 1/4 cup) and then pour the remaining whipped cream into the bowl with the mascarpone mixture. Gently fold the mixtures together. Fold in the “swirl” until about 3/4 incorporated. You’ll want to still see swirls of the fruit. In a pretty bowl, or individual clear glasses, layer as follows: swirled cream, complimentary fruit, swirled cream, complimentary fruit, swirled cream and complimentary fruit. Top with toasted coconut, crumbled cookies, or shaved chocolate. Cover and chill until serving. Will hold, covered and in the fridge for 2-3 hours. Fruit Fool to Carry You Far and Away! Recipe©Marcia Lahens 2015. All rights reserved. Some of you may be thinking that this will be so rich you won’t be able to eat it. Actually, it feels rather light on the tongue, but still lovely, soft and creamy, not too sweet, but just sweet enough and it’s cold and delicious. Do you need a cigarette yet? 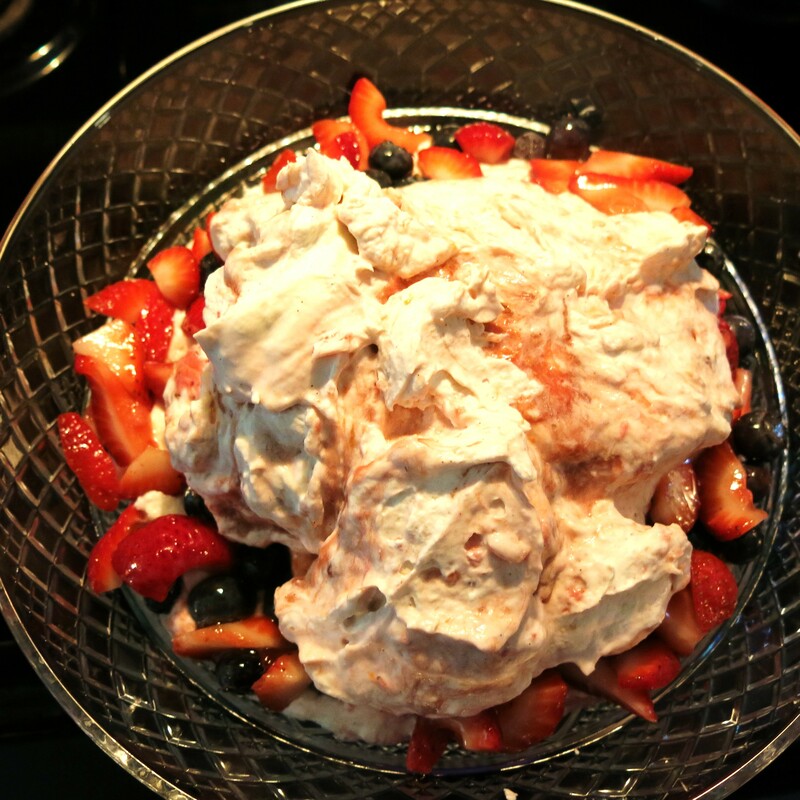 The Goddess is reasonably certain you could make this, using Option #1 above, but using the mascarpone and Greek yogurt from the recipe and layer the whole mess together, pop the bowl in the fridge for an hour or so and it would be perfectly fine when you serve it. I’ll let you know what happens when I try that. My personal favorite version of a fool uses blueberries for the swirl and for the complimentary fruit, diced mango with some mango-flavored rum added. It is just a gorgeous, summer day in a bowl.